These are the contents for the next Dorkbot Barcelona meeting. Zynthian is a sound synthesis platform that works on open source software and hardware as it is based on Raspberry Pi. Its small size and ease of use make Zynthian a perfect tool for the studio, audio production and sound design, and live performances. Easy to configure, hackable and update-friendly, Zynthian is open to anybody who wants to build their own Zynthian Box and thus contributing to its software development. Step by step, Zynthian is consolidating its community of users and currently there are people building their Zynthian boxes all over the world. Haptical Waves is a dual listening device (auditive and haptic). A generative audio bot plays in real time a musical composition through integral body listening. The auditive listening is made through binaural sound using headphones, while the haptical listening transports to the body the composition’s sub frequencies through the OHWaveSurf boards. This dual sensorial experience features a minimalist composition called OHPI, which is based on the 13 dimensions presented by some physics theories. Based on the 27.7(360º/13D=27.7) ratio and its proportions, that proposes a listening experience connected with cosmology and space. La Machine a coudre la musique (LMACLM) is an audiovisual performance that wants to induce the audience into hypnotic and oneiric altered states of perception, upon the repetition of both visual and sonic micro-loops. 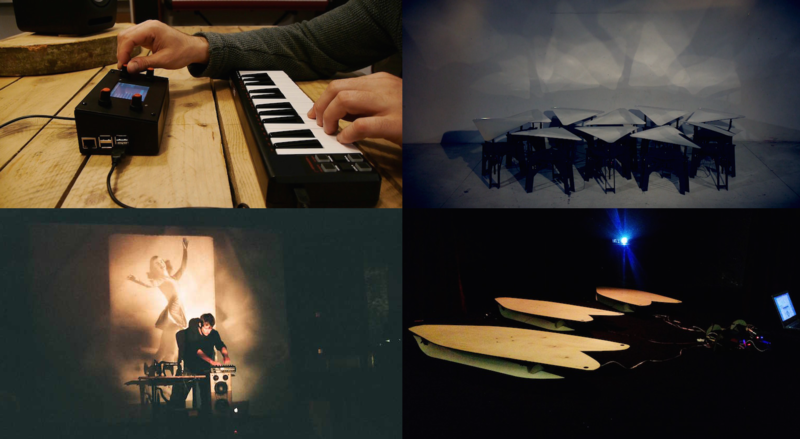 Patricio Rivera is back to Dorkbot, this time, with the kinetic sculpture Ocean Dream. In this piece, the artist reconstructs symbolically the maritime space crossed by the “illegal” migrants in their attempt to get to the European coasts. Ocean Dream consists on a set of sound generators based on the behavior of the ocean drum, a percussion instrument that evokes the sound of the ocean waves. The sculpture moves in real-time from the data collected by a floating buoy in the sea of Lesbos that tracks the movement of the ocean. The audience experiments sensations that are only “illegal” migrants are able to feel in their flight. Ocean Dream has been produced within the Hangar artistic residencies program and was selected by the Mostra Sonora i Visual at Convent de Sant Agustí (Barcelona) last June. The Issue 5 : “Alien Capitalism: Xenopolitics of the Anthropocene” was published on February 4, 2016, for Transmediale in Berlin and funded through a Goteo crowdfunding campaign.